Storms split this tree located in Creve Coeur. If you have a split tree, the crack alone may not be the reason to save or eliminate a tree. It’s the combination of the tree’s size and type, and size of the crack that determine the action to take. Likewise, the location of the crack or damage. The best option may be removing the entire plant if the damage is severe. If the damage is minor, merely pruning a limb off, may do the job. 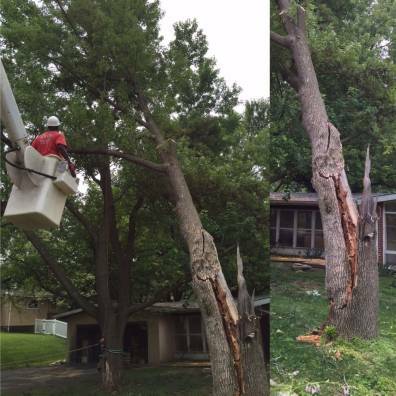 Final decisions and actions for cracks and splits are a task for a properly trained and experienced tree care professionals like Jackson Tree Service.